The reigning MVP became the first NBA player to score 30 or more points against all 29 opponents in a single season. Harden posted 31 points, 10 assists and eight rebounds in the Rockets’ 121-105 win over the Atlanta Hawks last night. 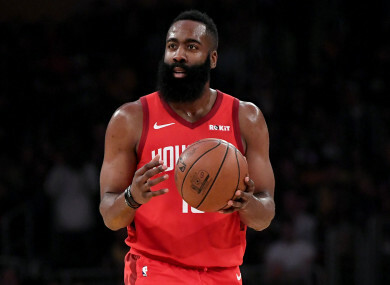 The reigning MVP’s performance saw him make more NBA history as the Rockets extended their winning streak to three games. Email “Rockets' James Harden completes the set to make NBA history”. Feedback on “Rockets' James Harden completes the set to make NBA history”.